“War is a disease,” Ales Kot said in an interview with Multiversity Comics, “and it seems that a large part of humanity is obsessed with it.” The writer of comics that range from the stream-of-consciousness apocalyptic tale CHANGE to DC Comics’ Suicide Squad draws on this point of view, developed in his native Czech Republic, for his new series ZERO, out from Image Comics in September. “I’ve seen, first-hand, what kind of damage war inflicts on people, and how often the wounds become obscured as the decades progress,” he said. ZERO is named for its main character, secret agent Edward Zero, a sociopath who solves problems with violence, a perfect execution machine. 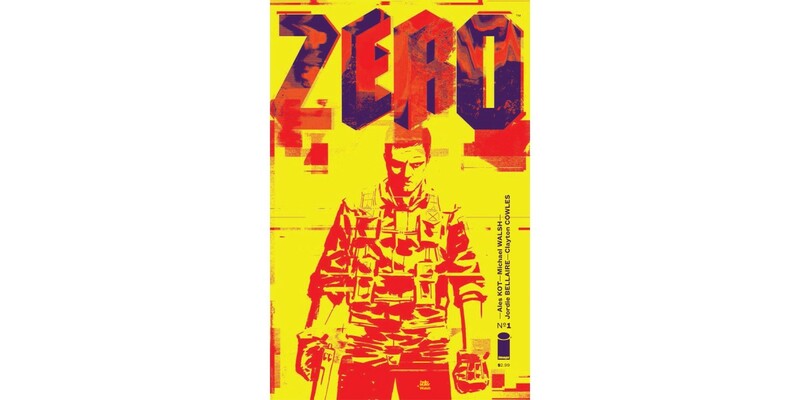 He’s built his life around certain principles, but ZERO is the story of what happens when his carefully maintained systems break down and Zero must fight not just a war out in the world but one within himself as well. Each issue will end with this internal struggle producing an indelible change in Zero, and so each issue will be drawn by a different artist. The first issue, in which Zero encounters a bioengineered terrorist whose body is a bomb, is drawn by Michael Walsh, who previously worked on the critically-acclaimed time travel Image series COMEBACK, written by Ed Brisson. Subsequent issues will be drawn by comics stars like Mateus Santolouco (Dial H, Teenage Mutant Ninja Turtles), Morgan Jeske (CHANGE), Tradd Moore (THE STRANGE TALENT OF LUTHER STRODE), and Tonci Zonjic (WHERE IS JAKE ELLIS?). Kot will write each issue based on the strengths of the artist, and the series will be colored by Jordie Bellaire (THE MANHATTAN PROJECTS, NOWHERE MEN). "With Zero, Kot continues to push boundaries of both form and content to stunning and inspiring effect. A new kind of spy thriller written with scope, intelligence and flat out gripping storytelling, Zero is easily one of my favorite reads of the year." "A first issue is the buy-in of the great game, story. This is Zero, and it's where all the action is. Have a seat."